Serving Auburn Hills, Lake Orion, Oakland Township, Oxford, Rochester Hills, Shelby Township and Troy. Guitar lessons for all ages. Advanced or beginner, Connolly Guitar Studios offers inspiring instruction that will improve your playing style. 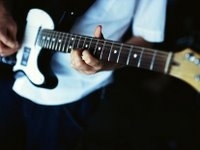 From rock to classical, we provide the teaching to become a better guitarist. Join us today. Hours M-Fri 3-8 by appointment. Connolly Guitar Studios offers a proven teaching method with over 20 years of teaching experience. Looking to improve, tired of your playing style, or just getting started, let us help you intensify your guitar skills. Acoustic and electric guitars each lend themselves to a unique individual sound that can be greatly enhanced when you have the insight. Let us show you how to get the most out of your guitar with various methods and techniques. Playing guitar with others can be intimidating if you haven't done it before, but Connolly Guitar Studios can get you ready for playing in a band in no time. If you're ready to commit the time, we're ready to give you what it takes to be rockin' with best.